In this unit, students will focus on the words is, me, my, and this. The noun for this unit is dog. This unit has several manipulative tools, learning centers, and tracing worksheets. This sheet shows all of the sight words for this unit (is, me, this, my, dog). There's an at-home practice activity at the bottom. Have students use their scissors to cut out the letter tiles at the bottom of the page. Then use a glue stick to attach them to the squares at the top to make sight words. Read each sight word. Then trace and write on primary-ruled lines. Trace each word two times on this worksheet. Read each word. Then write each one two times. Cut out the words and glue them onto the paper to make a sentence. Sentence reads, "This is my dog." 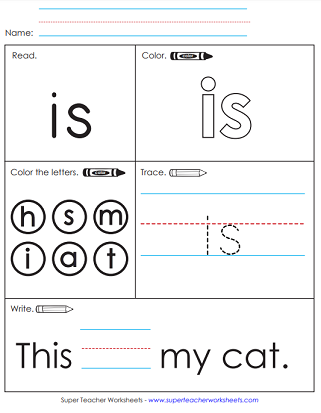 This is a learning center activity in which students use an ink pad and letter stampers to make sight words. Read the sight words on the sight word caterpillar to a family member or friend. Cut out the sentence strips. Have students read them aloud to a teacher, friend, or parent. 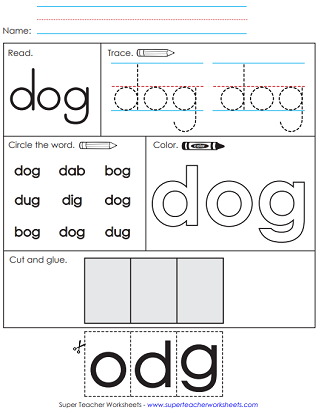 Students can practice their sight words from Units 1 and 2 with this printable. There are two sentences for them to read using the sight words they have learned as well. Complete this activity to practice reading and writing the word is. Trace, write, circle, and color the word this. Then cut out the letters in the word, and glue them onto the bottom of the page. Trace and write the word my. Then write the word in the blank space to complete the sentence. "This is my crayon." After that, students can draw a picture to go with the sentence. Trace and write the word me. Then write the word in the blank space to complete the sentence, "Do you see me?" You'll need a glue stick and scissors for this dog activity. This set of flashcards can be used for fluency practice, small group instructions, or learning games. Cut out and put together this word wheel for students to practice reading their sight words. For best results, try printing this on card stock paper. Assess students' ability to read Unit 2 sight words. This page has three assessment forms. If you prefer a biweekly test, use this file. You'll have students read each word in units 1 and 2, as well as two complete sentences. Students can circle words as they are read aloud by their teacher. Here's a PDF with a complete listing of all words in units 1 through 30. There are 150 words in all. 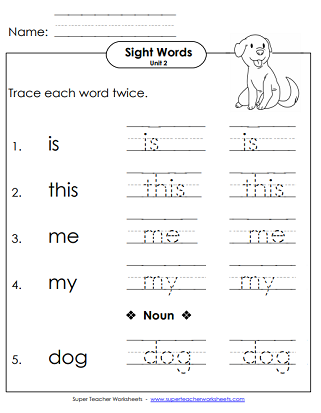 This page will link you to any of the 30 STW Sight Word units.